Tag Archives: wholesale training gear. There are only two more weeks to go for our 40mm jigsaw mats to arrive. We currently have over 600 mats on the high seas. They will be allocated on a first come first serve basis. So be sure to reserve your mats. Not to fear though. If you miss out on these we will surely have another container arriving soon after. 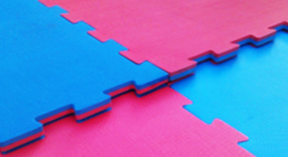 Our latest shipment of jigsaw mats will be leaving China on the 5th May. They will take two weeks before they reach our shores by boat. The container will be delivered and unloaded at our warehouse in Belmore. In total there are 600 40mm jigsaw mats arriving with this shipment which includes shipping cartons. Order your mats today if you would like to reserve stock. From our experience the mats will sell fact and you may miss out if you don’t reserve yours. You can also visit us at: 705 Canterbury Road Belmore NSW. Ezymats have the unique position for an Australian company of having a presence in China. As such we have able to source all your training needs direct from the factory. The quality will always be good and price excellent. Our sourcing ability includes all MMA and martial arts training gear. Aa well a our EVA jigsaw mats we can source: gloves, hits, bag, protectors uniforms, wrestling dummies, etc. So whatever you products needs please contact us for pricing. Delivery is usually 4 weeks as we add any order to our shipment of mats. We normally have 40′ containers so there is space to add to our shipment.